“This fiery, compassionate collection presents a complex, richly textured exploration of Pakistan, its layered past and tragic present. 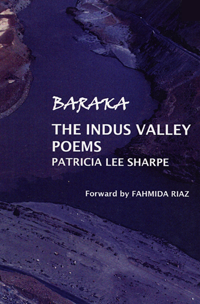 Sharpe does not cloak her poems in feminist rhetoric; she presents instead a nuanced, compassionate vision that yearns for Pakistan’s return to its profound lost beauty. She is a careful observer, reveling in the richness of juxtaposition and has a well-tuned ear for the subtler rhythms that accent Pakistan’s brutal streets…..” Kirkus. while others pray for other boons. in all of this—and all of us. or a patch to shade to wait for the bus. The shrine, stingily endowed, needs paint. as a marbled dome on full moon night. too late. The cat jumps down.